An electrical conductor is a substance that allows an electrical current to pass through it. Electrical conductors are usually metals. Copper is one of the best electrical conductors, and this is why it is used to make conducting wire. In reality, silver actually has an even higher electrical conductivity than copper, but silver is too expensive to use. 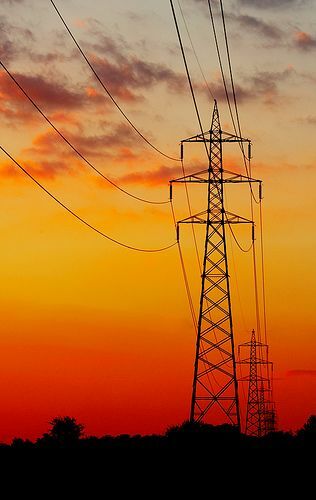 In the overhead power lines that we see above us, aluminium is used. The aluminium usually surrounds a steel core which adds makes it stronger so that it doesn't break when it is stretched across distances. Sometimes gold is used to make wire because it is very resistant to surface corrosion. Corrosion is when a material starts to deteriorate because of its reactions with oxygen and water in the air. An insulator is a non-conducting material that does not carry any charge. Examples of insulators are plastic and wood. Semi-conductors behave like insulators when they are cold, and like conductors when they are hot. The elements silicon and germanium are examples of semi-conductors. a selection of test substances (e.g. a piece of plastic, aluminium can, metal pencil sharpener, magnet, wood, chalk, cloth). 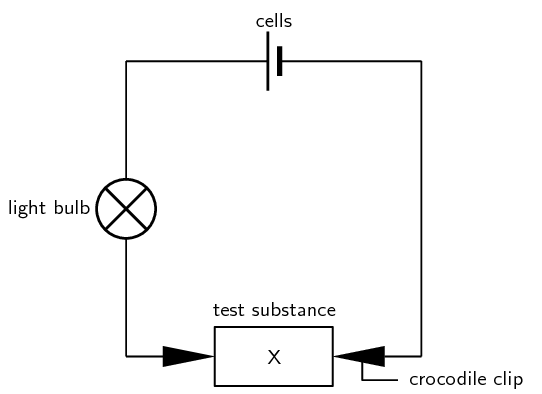 Set up the circuit as shown above, so that the test substance is held between the two crocodile clips. The wire leads should be connected to the cells and the light bulb should also be connected into the circuit. Place the test substances one by one between the crocodile clips and see what happens to the light bulb. If the light bulb shines it means that current is flowing and the substance you are testing is an electrical conductor. Does the light bulb glow? In the substances that were tested, the metals were able to conduct electricity and the non-metals were not. Metals are good electrical conductors and non-metals are not.